Napalm is a sticky, flammable substance that was invented in the 40’s, and used in several wars. Because of it’s stickiness, it attaches itself to everything, then burns at somewhere over 800 degrees. When it’s done, there’s no more jungle. No more enemies walking around. It’s vile enough, that it’s use on concentrations of civilians was declared a war crime by the UN in 1980. By now, you’re probably wondering why a site about personal finance is discussing Napalm. Well. Here’s the thing. Debt is a funny thing. Most of us have it. Some of us have quite a bit. And most of us would like to get rid of it. In fact, most of us would just love to Napalm our debt. One fell swoop. Drop some sticky burning substance on it and have it gone in a few short minutes. We’d like that so much that we buy lottery tickets, raffle tickets, and buy books and products that promise some get rich quick scheme. People with debt are always looking for the debt Napalm. The truth is that debt is so easily gained, we want to find a solution to it that is just as quick. An afternoon with a credit card and a shopping mall can add thousands to the total. Thousands that could take us years to pay off. We wish we could find the Napalm to incinerate our debt. Some people think that bankruptcy is that Napalm. But, as quickly as a bankruptcy can eradicate your debt, it doesn’t leave you without any scars. For many years afterwards, you, and your credit score, will suffer the consequences of the bankruptcy. Credit will be nearly impossible to attain. Prospective landlords and employers are even running credit checks before renting or hiring people. We need to stop looking for the Napalm. We need to stop assuming that all is lost. We need to take some responsibility, find ways to make more money, save more money, and pay down more debt. We need to stop adding more debt. If you want to get rid of your debt, it’s a slow burn, not a Napalm strike. 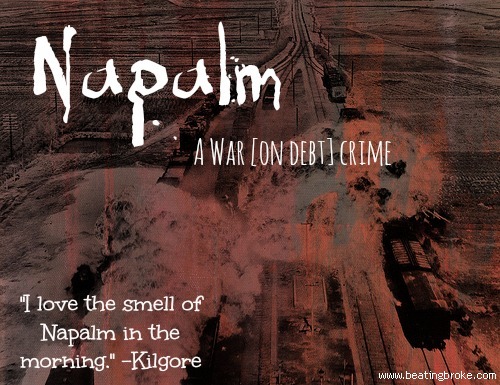 Even in the world of personal finance, Napalm is a war crime.